This incredibly long-awaited meeting of minds must surely rank as the most enticing prospect in Konkurrent's ongoing In The Fishtank series: Mark Linkous of Sparklehorse teams up with Christian Fennesz once again, this time for a whole album together. 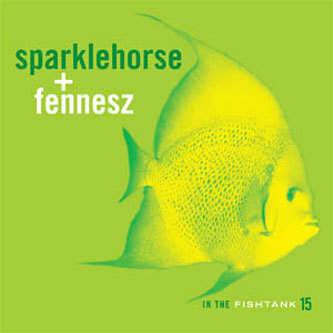 Previously Fennesz had contributed to Sparklehorse's 'Dreamt For Light Years In The Belly Of A Mountain', and the two had performed together, but this long-player represents a full and balanced collaboration. As with all the In The Fishtank releases, this was recorded in a mere two days, and yet there's nothing cobbled together or insubstantial about the project. 'Music Box Of Snakes' is a wonderful starting point, layering harmonised cello, piano, treated music box loops and a drove of electronic signals all making up an exquisitely melancholy soundscape. You might, understandably, have felt cheated were you to be presented with a Mark Linkous record that he's not providing some kind of 'song' content for. Fortunately he does just that on two of this record's finest moments: the laudanum-drone lullaby 'Goodnight Sweetheart' and the weightless, whispered chord-clouds of 'If My Heart'. Further fiery improv material arrives in the form of 'NC Bongo Buddy' (whose dense, noisy manoeuvrings at times tap into the free-roaming spirit of the Fenn O'Berg material), while two of the most surprising moments on the record arise from solo spots by each artist. As if participating in some sort of exchange programme, 'Mark's Guitar Piece' dabbles in machined, digital augmentations while 'Christian's Guitar Piece' is an unaccompanied, untreated six-string outing that's unprecedentedly stark and unguarded in the context of Fennesz's catalogue. Incredible stuff - Very highly recommended.